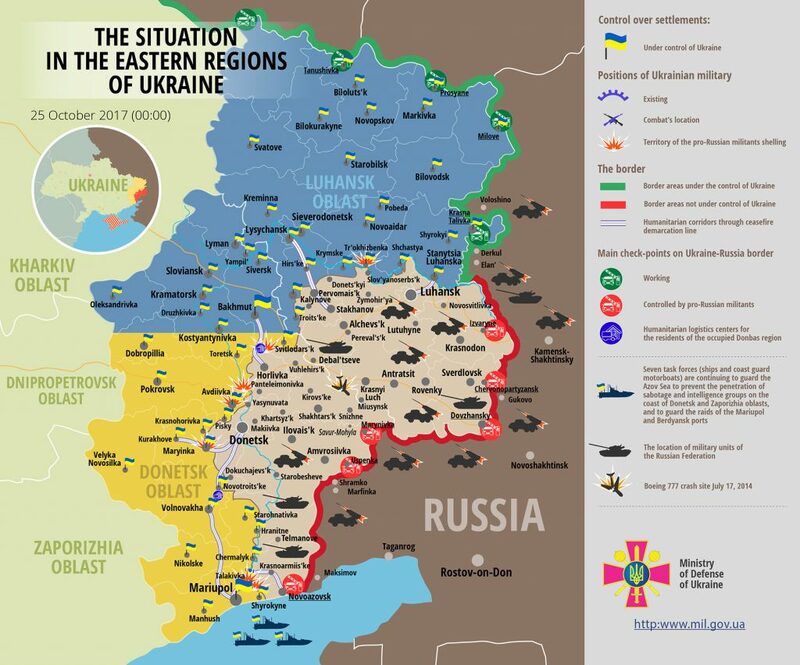 The situation remained restless in ATO zone yesterday. Four Ukrainian troops were killed in action and four more were wounded. “All wounded servicemen were promptly evacuated to military mobile hospitals and other medical institutions. Their injuries are not life-threatening,” reported Ukrainian Ministry of Defense spokesman on ATO Colonel Andriy Lysenko at a press briefing at Ukraine Crisis Media Center. In total, Russia-backed militants committed 15 ceasefire violations yesterday. Ukrainian troops returned fire in most cases. The situation was the most restless in Mariupol sector where militants conducted eight aimed attacks at Ukrainian positions. Russian proxies shelled Ukrainian positions near Vodiane twice using 82-mm mortars. They also fired four mortar rounds at Ukrainian stronghold near Talakivka. “Moreover, pro-Russian militants attacked Ukrainian positions near Vodiane, Talakivka, and Maryinka with grenade launchers and small arms,” informed Col. Lysenko. “Ukrainian troops responded with small arms and light weapons fire,” added the spokesman. In Donetsk sector, militants opened using grenade launchers and small arms six times: near Verkhniotoretske, Avdiivka, Kamianka, Zaitseve, and Luhanske. “Ukrainian troops harshly defeated all hostile provocations with the fire of various grenade launchers, heavy machine guns, and small arms,” said the spokesman. In Luhansk sector, Russian proxies conducted one brief small arms attack on Ukrainian positions near Triokhizbenka. “The attack wasn’t posing any real threat, so Ukrainian troops did not return fire,” said Col. Lysenko. Report on the military developments as of October 24 is available here. Interactive data on the shelling: chronology shelling chart and the interactive map.